I am here to share my card for yesterday's Mojo Monday. I was very pleased with the way this one turned out. I used Not Quite Navy, Ruby Red, Always Artichoke, Kraft and Water color paper. I also used a few distressing inks in a lot of places on this card. I used "Weathered Wood for the edges of the base of the card. I distressed the edge and bottom of the Ruby Red piece with "Firebrick Red" to include over the embossed part at the bottom. I use "Antique Linen" around the edges of the watercolor pieces. 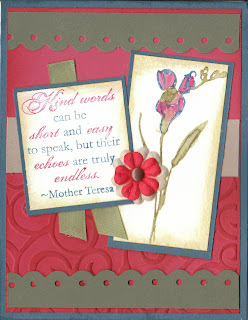 The sentiment and flower are from SU's retired hostess set "Echoes of Kindness." I used Watercolor crayons and markers to stamp the images in. If I had to pick one area that I would change with this card it would have been to make the red in the images and the sentiment a bit darker. Overall, I think it came out well, though. I hope you like it too. I also did a card yesterday for SCS Easel Card and Baby Wipe technique. I have decided from now on to upload cards for SCS sketches and techniques to the appropriate SCS gallery. If you would like to see those cards, please visit my SCS gallery. I would love to have your comments there as well. I loved the way your card turn out! We used the same scallop edge punch. I'm going over to take a look at your cards over on your SCS gallery. I havn't tried an easel card yet, but I love the way they look!